Are you looking to supercharge the search engine marketing (SEM) efforts of your small business? If so, there is a seemingly endless number of tactics to choose from to increase engagement and conversion—from experimenting with new networks to optimizing your current offerings. So, what should you concentrate on? There was a time when engaging consumers via digital could be separated into paid and unpaid efforts. For better or worse, that time is now past. In today’s world of blurred digital lines, paid ads can include unpaid content (for example, a display ad with a YouTube embed), and audiences built naturally can sometimes only be reached if you spend money on media (i.e., Facebook Brand Pages). This is particularly true when it comes to small businesses and SEM. Now, paid search ads are often linked to things like Google+ Local Pages and Facebook Pages, making “paid” and “unpaid” digital offerings deeply intertwined. Because of that fact, it is essential for small businesses to optimize their various organic digital presences (websites, social media pages, online local listings, etc.) before spending additional money on paid media. A good place to start with this task is Moz Local. The free tool allows you to enter your business name and location, then tells you whether you are correctly represented across various platforms. First, targeting search ads based on geography is much more efficient. Rather than vying with other advertisers nationally (or even internationally) for placement with an untargeted ad, you reduce competition by only going after certain locations, thereby often significantly lowering cost. Second, many small businesses are local businesses, meaning that ads that are not geo-targeted are often reaching the wrong audience. This can lead to low click-through rates and/or produce leads that are not useful. While it may appear daunting, targeting search ads based on location is actually relatively simple. This overview from Google outlines the basics and shows you how to set it up. 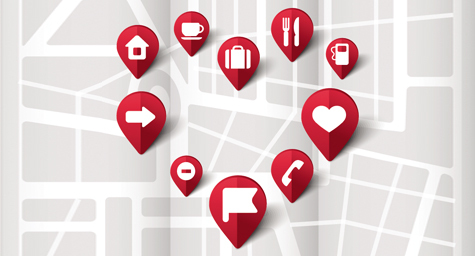 One thing to keep in mind is that search location has two components: the business location and the user location. The search engines let you target each of these separately (for example, if you’re a realtor in L.A. who wants to reach potential buyers currently in New York). This page from Google explains how to deal with a few of the most common of these situations. Search ads used to be just a few lines of text and a URL. These days some still are, but others are far more dynamic. This evolution is largely thanks to Google Ad Extensions, which allow publishers to link their search ads to things like local pages, phone numbers, and app downloads. For small businesses, these “extensions” are important because they allow for additional functionality, in addition to providing more information. For example, the phone extension lets users dial directly from the ad, the map extension displays exact location, and the information extension can directly show ratings and reviews. Each of these can significantly boost the effectiveness of your search ads, providing more context and allowing for easier engagement. When it comes to search, Google often dominates discussions given its large market share. This makes sense, of course, but it means that advertisers often miss out on opportunities with other platforms, especially Microsoft’s Bing. Don’t make this mistake. In the first quarter of 2014, spend on Bing grew by 60% year-over-year. Why? Because the network has often has lower CPCs (i.e., ads cost less) and also offers a unique set of platform-management tools that is in some ways better than Google’s. Moreover, thanks to its deal to supply results for Yahoo! and the steady deterioration of other search engines, Bing now has enough scale for advertisers. In fact, it earned 24% of all search spend last quarter. Given all this, makes sure to at least investigate Bing when planning your campaigns. You may find that it costs less and reaches an extended audience. Finally, to truly succeed with SEM you’ll need to regularly test the effectiveness your ads and landing pages. In particular, you should A/B test various combinations to see which copy, links, and pages work the best. For small businesses, this part of the process is often skipped. After all, it takes a lot of work to write, target, and monitor your initial set of ads. Who has the time and manpower to keep testing and revising? Fortunately, the undertaking isn’t as difficult as it sounds. When it comes to copy, there are some fairly simple techniques that can be utilized to test the performance of various ads. For example, this strategy is relatively quick and painless. Testing the performance of landing pages is now do-able for small businesses as well, thanks to new tools, such as Optimizely, that are both easy-to-use and fairly inexpensive. Ultimately, each of these strategies on its own may not dramatically affect your search campaign performance. However, if you use them in combination and regularly invest the time in refining your efforts, you should see a significant impact. Keep up with what’s new in search engine marketing. Contact MDG Advertising today at 561-338-7797, or visit mdgadvertising.com. MDG Advertising, a full-service advertising agency with offices in Boca Raton and New York, NY, is one of Florida’s top branding firms. MDG’s capabilities include print advertising, direct mail marketing, branding, logo design, creative, digital marketing, media buying and planning, radio and TV advertising, Web design and development, online video advertising, infographic development, email marketing, content marketing, lead generation, social media marketing, and SEM. For the latest trends in advertising and branding, contact MDG Advertising today at 561-338-7797 or visit mdgadvertising.com.